Award-winning games to feature in regulated market for first time. Players now have access to a number of Quickspin’s most popular titles, including Sakura Fortune, Dragon Shine, Phoenix Sun, Wild Chase and Second Strike, with more to follow in the coming months. Daniel Lindberg, Quickspin CEO, said the agreement was one of the supplier’s most significant in recent times. He added: “We are delighted to have secured a deal with Pokerstars. Going live with them is exciting for us and continues our exciting plans for expansion. The Stockholm and Malta-based supplier has had a record-breaking year so far, including the release of EGR shortlisted ‘Game of the Year’ Eastern Emeralds, containing one of the industry’s highest-ever multipliers. 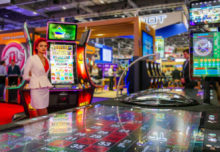 Founded in 2011, Quickspin quickly established itself as a leading development studio for real money and social casino gaming and was acquired by Playtech in March 2016.